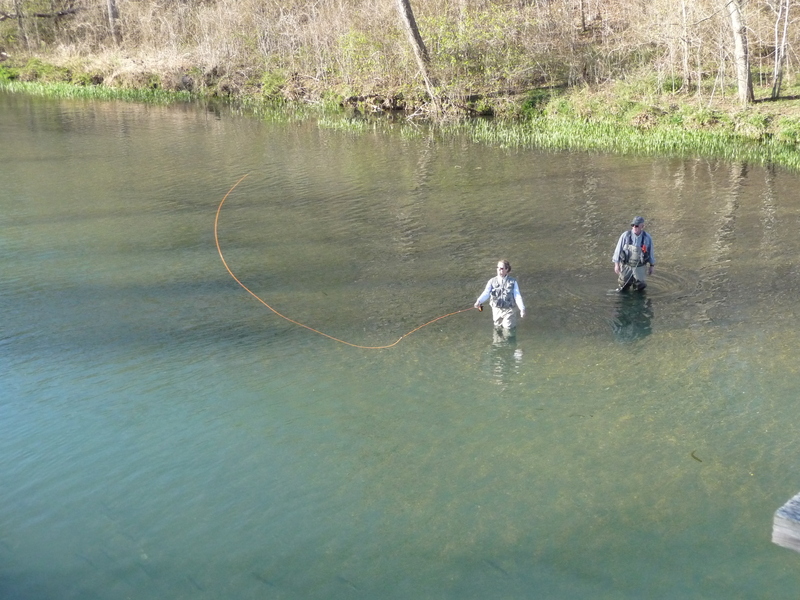 Rockbridge’s stunning spring-fed Spring Creek offers exciting fishing for all fishermen from the novice to the expert. Use your fly rod in the rapids; teach your children to cast below the waterfall; or catch your own perfect rainbow! Our stream offers a variety of conditions unique to both fly-fishing and light tackle fishing. From beautiful rapids to slow moving currents, sunny shallows to shaded deep pools, Spring Creek offers it all. Crystal clear waters, a gorgeous waterfall, towering trees, and monumental bluffs are just part of our spectacular setting. 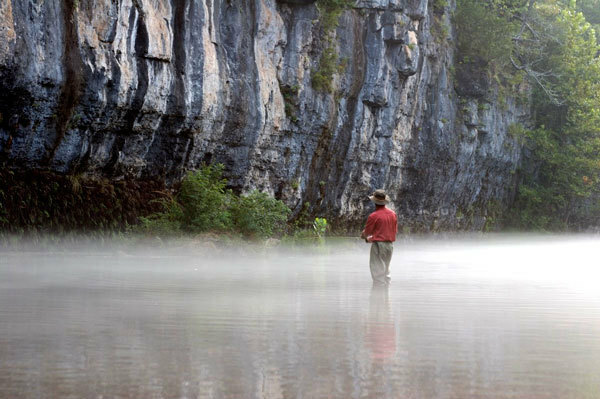 Generation after generation of families come to Rockbridge, Missouri, for the challenges it offers the most experienced angler, and yet the ease and success it offers the beginner. An average trout weighs about 2 pounds, but who knows, you may be the one to break our 16 pound record. 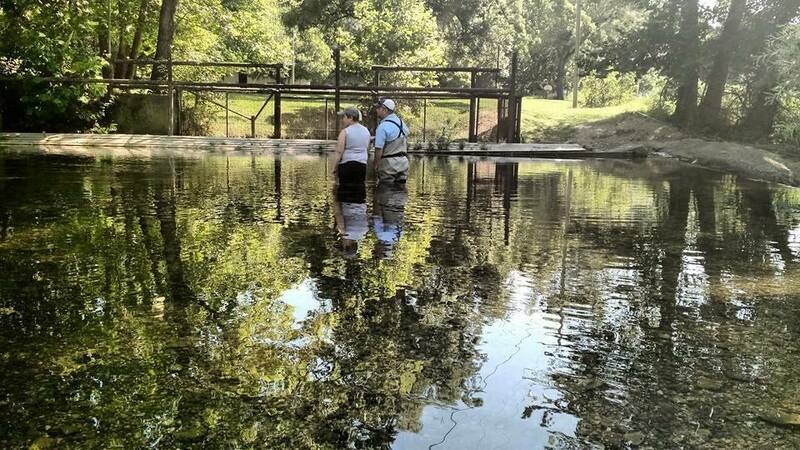 Rockbridge is privately owned so you do not have to have a Missouri Fishing License or a Trout Stamp to fish here. You will need to bring your own fishing rod as we do not have rentals available. We do have a limited supply of tackle available for purchase in our store that's located in the lodge. Our Catch & Keep fishing permits are $30 per day, per guest 13 & over. 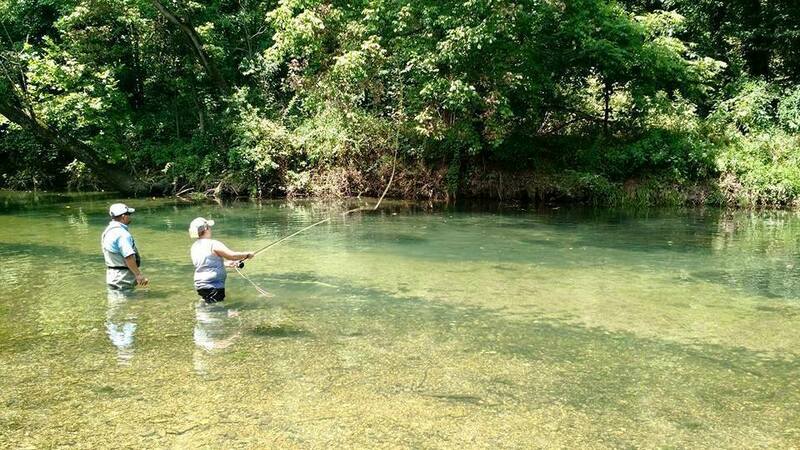 You must keep everything you catch and the trout are $4.75 per pound live weight. Our fish cleaners will clean, package, and freeze your fish for you; then when you are ready to head home they will pack them up for you. Catch & Release permits are $125; these permits are sold per day, per guest for use in our designated catch & release area and require fishing with a fly rod with a small barb-less hook. Other restrictions may apply. Half day permits are available. Rockbridge offers personalized fly fishing instruction and guide service from our certified professional guides. Eight hours of premium trout fishing with effortless results! You will catch a Rainbow! Our guides are $150 per day for the first person. Additional anglers are $50 each (limit of 3 per guide). Cost of fish and permits are NOT included. Fish the day away, set your own schedule, and lunch is on us! Just grab your waders (only if you want them) and sign up for your trip today! Each half or full-day guided fishing excursion includes the following. Reservations are required so be sure to call ahead to book your guided fishing excursion. The Rockbridge Hatchery started in 1954. It was impressive; one wire cage sitting in the creek. Over the years, we have learned many lessons about raising these spectacular Rainbows… Rockbridge now raises over 200,000 fish yearly in our hatchery. The eggs are taken by hand, the hatchlings fed by hand,and the trout moved by hand assuring that our trout meet the high standards of the Rainbow Trout and Game Ranch.